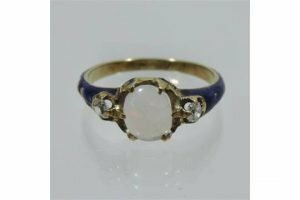 A Victorian gold, blue enamel diamond set and moonstone ring. 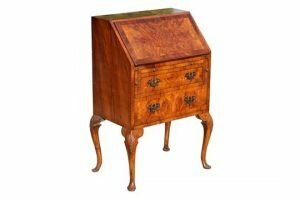 An early 20th century burr walnut fall-front bureau of small size, with carved cabriole legs and pad feet. 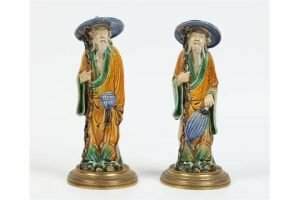 A pair of Antique Chinese tang style glazed earthenware figures of sages, raised on European gilt bronze plinths. 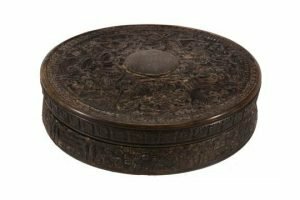 A Chinese circular horn box and cover, 19th century, decorated with figures, pavilions and trees. 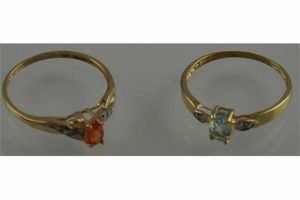 A 9ct gold, yellow sapphire and diamond ring, together with a 9ct gold, aquamarine and diamond ring. 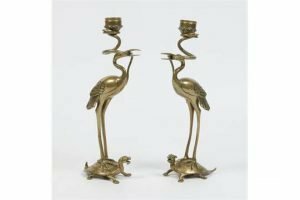 A pair of Japanese bronze novelty candlesticks, formed as cranes supported on flaming turtles and each with a serpent in its beak, supporting cylindrical nozzle. 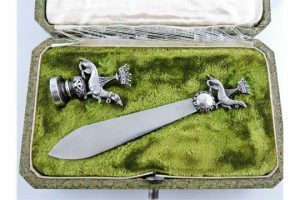 A French 19th Century cased silver seal, mounted with an ermine beneath a crown and a matching book mark, both in a shagreen case. 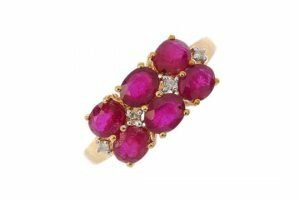 A 9ct gold glass-filled ruby and diamond dress ring, the oval-shape glass-filled ruby lines, with single-cut diamond highlights. Hallmarks for Birmingham. 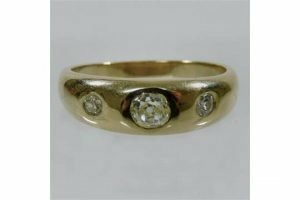 A 9 carat gold three stone diamond gentleman’s gypsy ring. 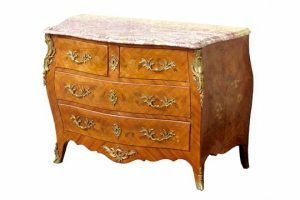 A mid 20th century French Louis XV style ormolu mounted kingwood & floral marquetry inlaid serpentine sided bombe commode, with marble top. 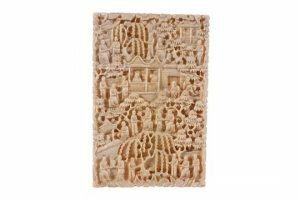 A Chinese Export Ivory Card Case of the usual flat rectangular form, elaborately carved to either side with complex generic scenes of figures, amid gardens and willows with occasional buildings. 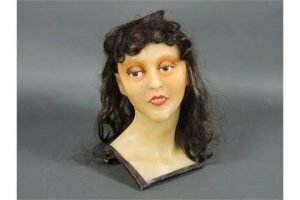 An unusual 1920s Art Deco wax mannequin head and bust of a young woman by Siegel of Paris. 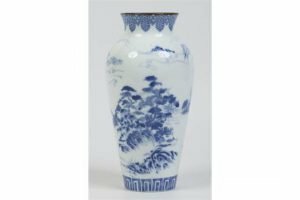 A Japanese Shibata blue and white baluster vase, decorated with a mountainous landscape. Printed marks. 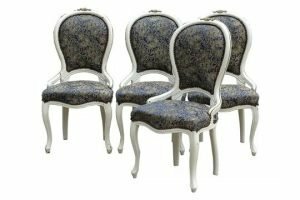 A set of four French Louis XV style white painted & blue floral silk upholstered side chairs, with gilt metal mounts, on cabriole front legs. 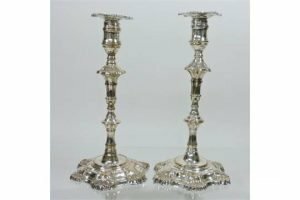 A pair of 19th century Sheffield plated table candlesticks, each with a knopped stem, decorated with shells. 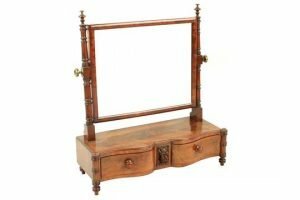 An early 19th century George IV mahogany rectangular swing-frame toilet mirror, with ring turned supports, on serpentine fronted two-drawer base. 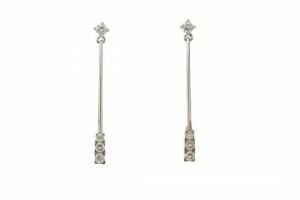 A pair of 18ct gold diamond ear pendants, each designed as a brilliant-cut diamond slightly graduated line, to the tapered bar and brilliant-cut diamond surmount. Estimated total diamond weight 0.25ct. Hallmarks for Edinburgh. 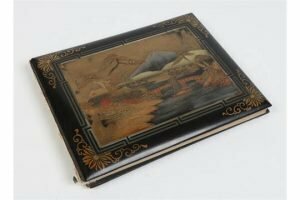 An early twentieth century Chinese lacquered photograph album. 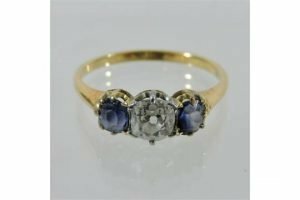 An 18 carat gold sapphire and diamond three stone ring, the central old cut diamond approximately 1/2 carat, flanked by two smaller sapphires. 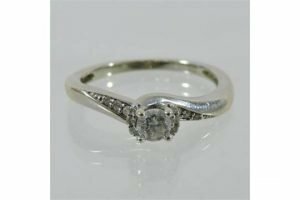 A modern platinum and diamond ring, of crossover design, the central diamond approximately 1/4 carat, flanked by twelve smaller.